Paul McCartney told students he will play a “secret” gig in Liverpool this week – as he answered questions about his life and career. The Beatles superstar hosted a Facebook live from LIPA this afternoon, with fans from all over the world sending in questions for the 76-year-old star. The intimate hour-long Q&A was held at the LIPA building, Paul’s former school, with students at the performing arts institute witnessing The ‘casual conversation’ with Jarvis Cocker. Questions centered on Paul’s illustrious career and his forthcoming new album Egypt Station which will be released on September 7. 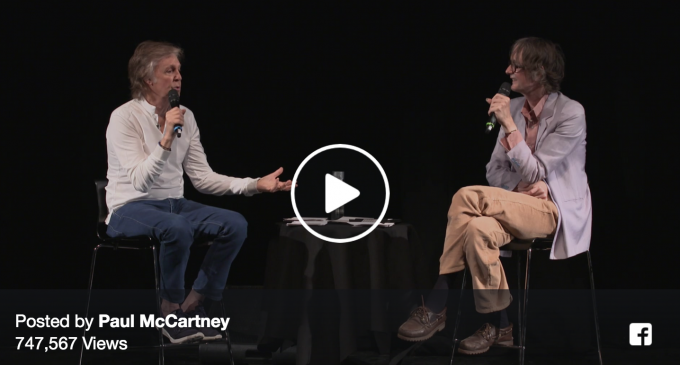 Paul McCartney at LIPA in conversation with Jarvis Cocker. LIPA was co-founded by Sir Paul in 1996 and he remains their Lead Patron – regularly hosting masterclasses at the institution. Paul most recently returned to Liverpool in June, when he filmed carpool karaoke with James Corden, ending in a secret gig at the Philharmonic pub. Paul was also spotted in a car with Corden on Allerton Road, in the city centre and at the Beatles statue on the Pier Head.